Don’t bother saving, Ben Bernanke told Congress one Wednesday, echoing a message the Fed has been sending to the middle class for 15 years. 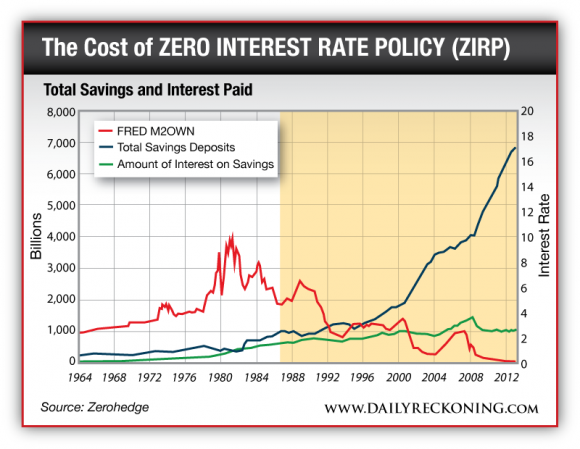 The zero interest rate policy (ZIRP) has been discouraging responsible saving and fueling a massive increase in Wall Street borrowing and speculating. And its unlikely to end anytime soon. The impact on your wallet is very real. Banks have reduced interest rates on deposits dramatically, leaving savers no option but to gamble on stocks or lose money to inflation every year. From 1964 to present, the chart shows a steady rise in total savings deposits, with significant growth after 2000. 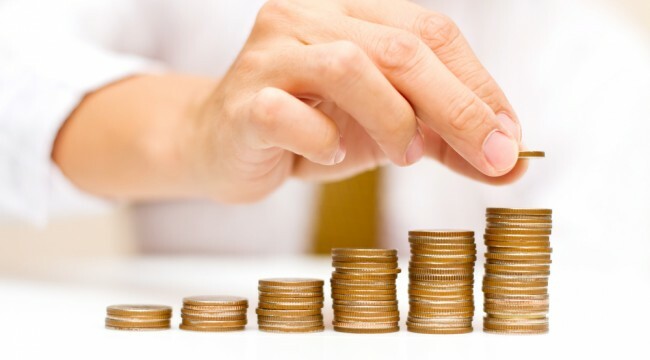 After peaking at 10% in the 1980s, average interest paid on savings declined steadily. It now hovers near zero. Meanwhile, despite the massive increase in the amount of savings by bank customers, income from savings has remained stagnant over the past decade. Of course, earlier trends parted around the year 2000, when the ZIRP era began. Since then, Fed policy has been focused entirely on making that unemployment number budge, at the expense of encouraging savings. Even though the Fed’s asset purchases may decline after 2014, ZIRP will likely continue long after. The days of parking your life savings with a bank may be gone for good. P.S. Readers of The Daily Reckoning get loads of tips on how to protect your assets from ZIRP and inflation. Click here now to sign up for free.